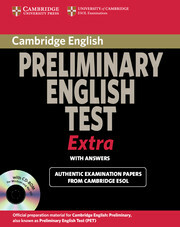 Cambridge Exams Extra provides authentic past papers from Cambridge ESOL, plus a wealth of extra material for use in the classroom or for self-study. This title contains a useful exam overview and helpful guidance on tackling each part of each paper. The accompanying CD-ROM contains the same four papers that appear in the book, giving students the option of trying out the PET in electronic format.